My daughter has taken to making steamers for breakfast, which she drinks alongside a plate of toast with marmalade. I especially like this drink as a mid-morning snack on a cold day. You can make this with any kind of milk you have — often we make it out of skim with a slug of cream stirred in — but it's a tastier brew when you upgrade out of non-fat. In a small pan over medium heat warm the milk. Add flavoring — vanilla or almond — and honey; stir to dissolve. Heat until hot, but do not boil. Whisk until frothy, then turn off heat and let sit for a minute. 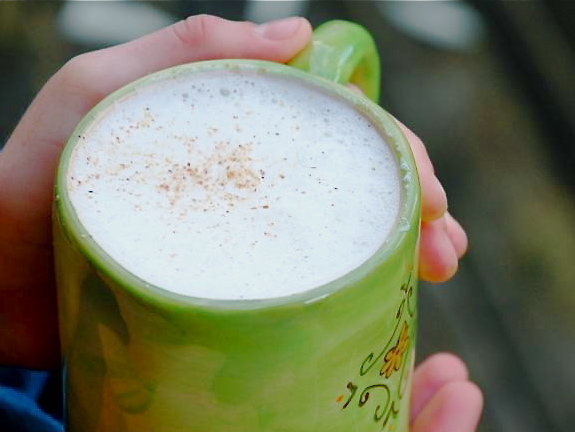 Pour hot milk into a mug and top with freshly grated nutmeg.